Spotify has created a new event for this April 24 for which they have sent invitations to all types of press. In this event they will unveil a new product which is unknown until now, but according to some users, could have to do with a competition for HomePod. Apple Music is taking away Spotify with each passing day, and with the arrival of HomePod users could end up totally stuck in the world of the apple. Keep reading this article to know more ! 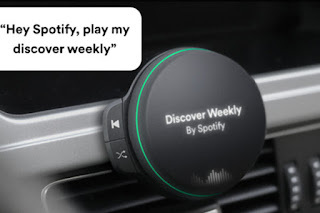 According to many of the rumors at the beginning, Spotify would be preparing to launch a device for the car capable of playing music and executing commands dictated by the user. However, the company has not wanted to testify about this. On the other hand, some users published on social networks that Spotify had offered a pre-purchase for a new product, which would come integrated with 4G and with the technology of Amazon's voice assistant: Alexa . The device, according to the emails received by the users, would have a price of 155 US dollars, which could be paid in a fee of 12.99 dollars per month, for a total of 12 months. However, another user stated that, while Spotify did offer the new gadget, it only allowed them to buy it for a single payment of $ 155 . It is quite normal that we see leaks of all kinds on the internet. Clearly this has been a minor mistake of Spotify, but it could advance us what we are waiting to see on April 24. The company does not want to lose its position as the king of streaming music, and while Apple offers a solution like the HomePod, Spotify will have to get down to work to get on the bandwagon of smart speakers. Would you buy this Spotify speaker? Leave us your answer in the comments!